The top is done for the pattern I'm testing for Cheryl, at Meadow Mist Designs, and I just love it! Had to hold it down with some pottery coasters and a small block as it is WINDY today! I wrote two posts, here and here so far about this quilt. After I'd sewn the first four blocks, I decided to lay out the remaining six so I could ensure even distribution of fabrics and colours and values. I had 4 on my design wall and one squished onto my sewing table. I still managed to repeat fabrics on more than one occasion, but phew! I caught it before I sewed it. It was beginning to make my head hurt a bit: as well as ensuring no two fabrics were alike in each block, I also tried very hard, and succeeded except for one rectangle, in having each fabric in a different place within each block! Once I finished all the blocks, my design wall wasn't quite big enough, so I laid them down on the floor to start to play with the orientation of each one. Here are the first six blocks as I make sure no two alike colours touch and that the fabrics are evenly distributed over the quilt top. There's something about newly laid out pieces of fabric, whether it's for cutting, for sewing if I stack things beside my sewing machine, for arranging blocks, or for admiring a flimsy laid out on the floor, she's just gotta get ON it and either hunker down as in the above photo, in readiness to scamper away, or curl and twist in purring cat happiness. Sigh. Cat fur is a fibre sadly lacking in the textiles I purchase apparently. So that was around suppertime yesterday, and then today I finished up the sewing and got my outside sunshiney pics, wind and all. Ha, the wind started to lift the one section in the top right, but at least this photo got the bottom corner in. I didn't even have time to stand on a patio chair for better height; it was okay! Held down, quick! Run to the end! Snap! Snap! Not fast enough for the last pic but I kind of like the wavy effect! Glad to get so many of these old fabrics into a rather pretty quilt, if I do say so myself! 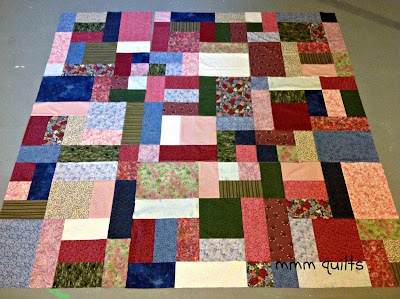 I think I am going to meander quilt this on my Avanté with the Lily Pad design from Christina Cameli's book, Step By Step Free Motion Quilting that I used on one of the seniors' quilts, or possibly the Bear Claw motif I just got note of today from her blog, which I follow by email. So back to Grande Scrappy Tiles, soon available through Meadow Mist Designs. I also had a thought to use flannel (once I pre-wash the snot out of it so it won't shrink) as the batting and have it as a summer quilt on our bed. What say you? Anyone done that before (other than me, in table runners)? It's not quite big enough for a queen-size bed, but I never have just one quilt on our bed anyhow, so no biggie! I think I will bind it with the original, the strongest, floral. 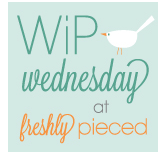 Linking up with WIP Wednesday and Let's Bee Social, see buttons below. :-) So much always to admire, to be inspired by, and always new bloggers to meet. 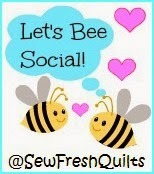 I have to say, being part of the New Bloggers group has been so gratifying already and we are only 3 days in! Such a fun quilt! I absolutely love seeing pictures of your little helper! Great job with those older fabrics.. it can be tricky sometimes! I love the finished look of this quilt! And the pattern would showcase fabrics well. 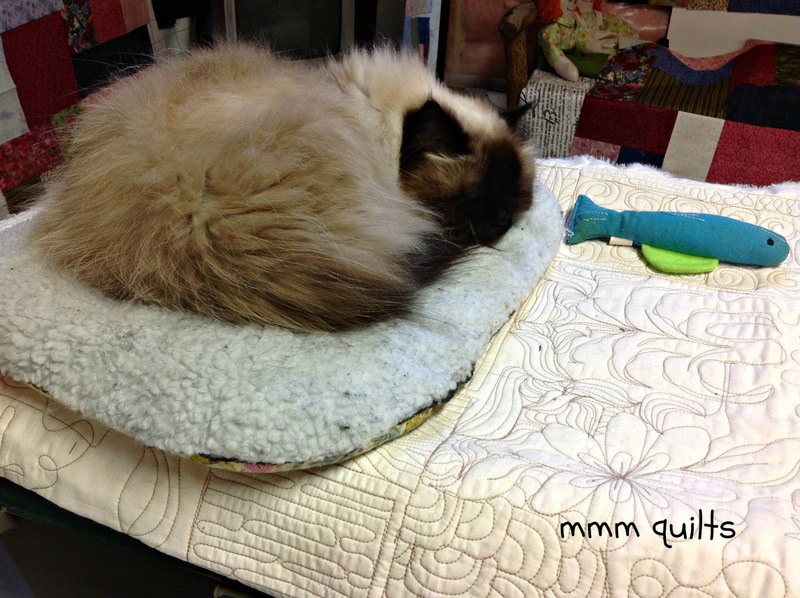 I love that you donated the wheelchair quilts, I do that when I can, and you are right, they are so appreciative! Sandra, it turned out maaaavelous! And that last picture with the wave - awesome! 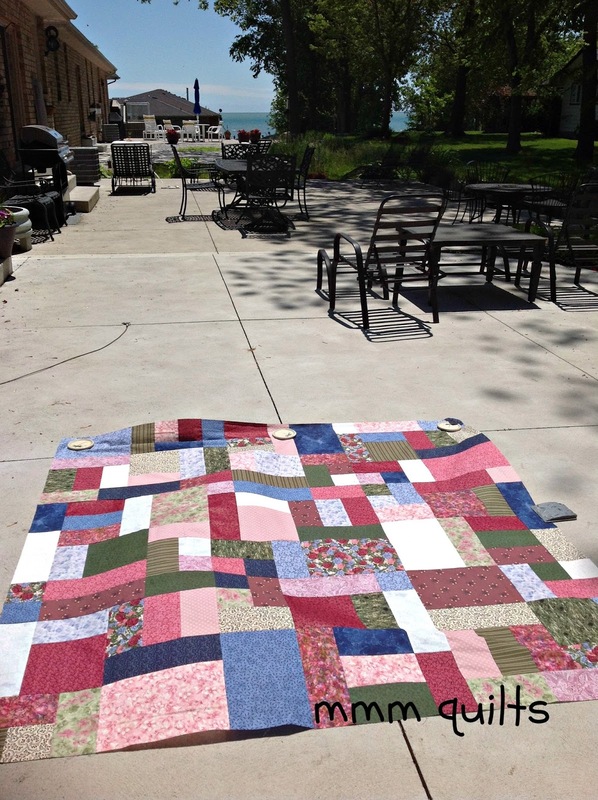 :) So glad your quilts will be loved and provide quilty hugs to people who really need it. And that your guild is going to make more? You rock! Oh my breath caught in my throat and "wow", "wow", "wow", just kept going through my head when I saw the first picture of the quilt. WOW!! It's fanTASTIC!! So glad the seniors LOVED the quilts and the lovingly thoughtful attached strings. (HA! No strings attached LOL). Good for you! LOL thanks for bringing to the attention of all your readers my lack of a life LOLOLOLOL!!!! Just kidding! I've told you before I wait til I have sufficient time and undivided attention before I read your blog, as it deserves that and I LOVE your blog! Yes, I've read and commented on each and EVERY one LOL! Oh, you forgot to mention how I scrutinize every photo too, geek that I am bahahaha! Can't answer your question on using flannel as I'm not a quilter, sorry!! 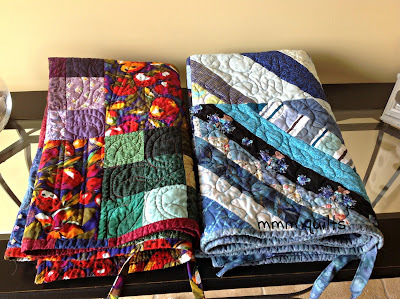 I just saw that Bear Claw quilting, too - it looks like fun! Hard to pick between it and the Lily Pad, though. Both would look great on that pretty quilt. 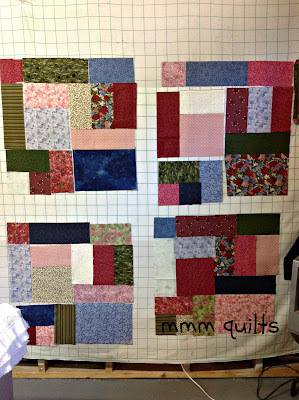 Your pattern test quilt looks great. Isn't it amazing how difficult it is to be random? It must be that our brains just naturally seek out and create patterns. I can just imagine how spectacular Lake Erie looks today. Yesterday the St, Clair River was the most beautiful shade of turquoise. I love the weather we've had the last couple of days, and wouldn't mind a whole summer of cool sunshine. You just reminded me that I really need to get Christina Cameli's book. I looked for it yesterday in a quilt store, but they didn't carry it. I will have to follow her by email. Your charity project sounds wonderful. 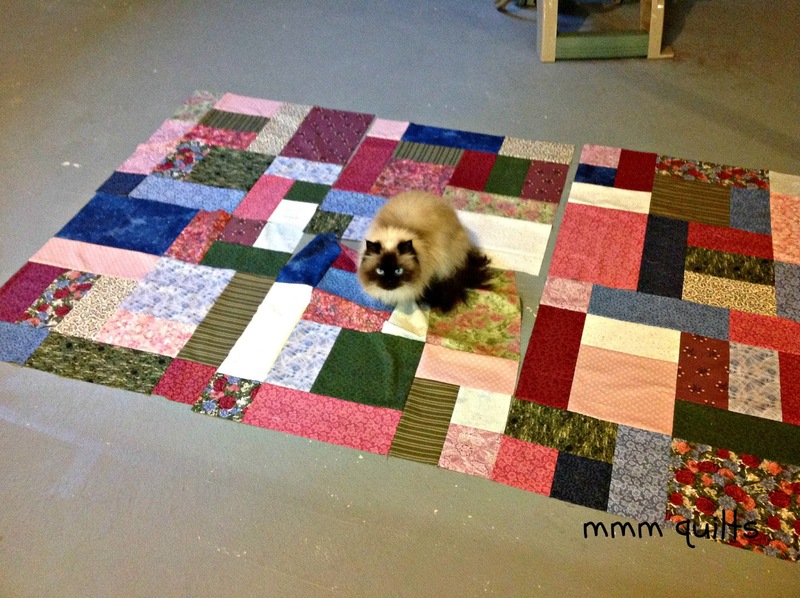 How big do you make the wheelchair quilts? 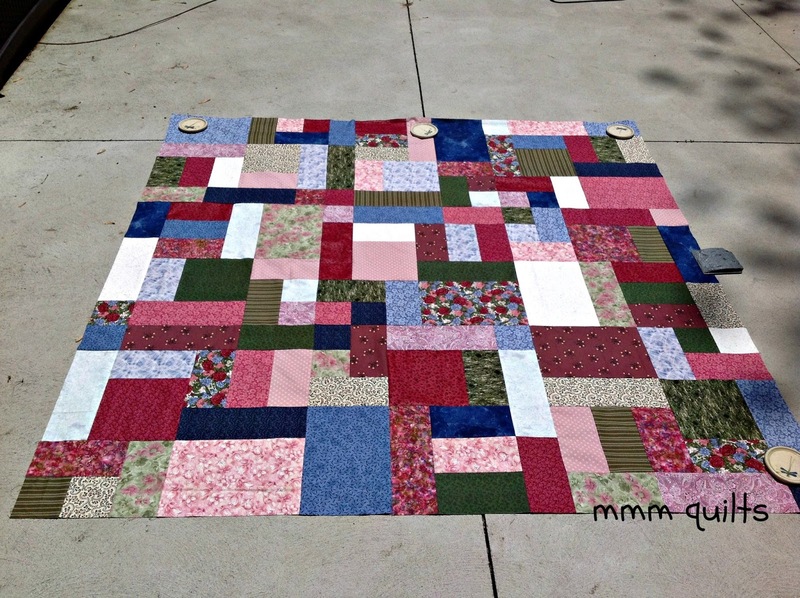 The Grande Scrappy Tiles quilt is beautiful! I keep looking to see if I can figure out the pattern, but maybe it is more of an improv type block?! That is just my style of quilt. I will have to check out Cheryl's pattern. I am watching the sun set tonight on the Oregon Coast (a retirement celebration trip!!!) and wishing I could live by water all the time! Hi Sandra, your Grande Scrappy Tiles turned out lovely. I hope to be able to quilt mine in the next week. I would think that the prewashed flannel could work as a lightweight batting alternative. I have actual used muslin yardage as a batting substitute multiple times and it worked quite well. It washed and wore like iron in kid's quilts. I am thinking of using it in my Plus Plus quilt that I tested for Cheryl as I want it to be lightweight, if the Queen size version could ever be light weight. What a beautiful top. The blocks are bigger than I expected. Your cat gives great perspective. ;) So glad to hear the two quilts were so appreciated. I'd say that pattern is a winner! I can tell you put a lot of time into the arrangement. Beautiful, just beautiful! random layout get tricky! I tend to lay them out in the morning and walk by it throughout the day moving things around. Very nice! 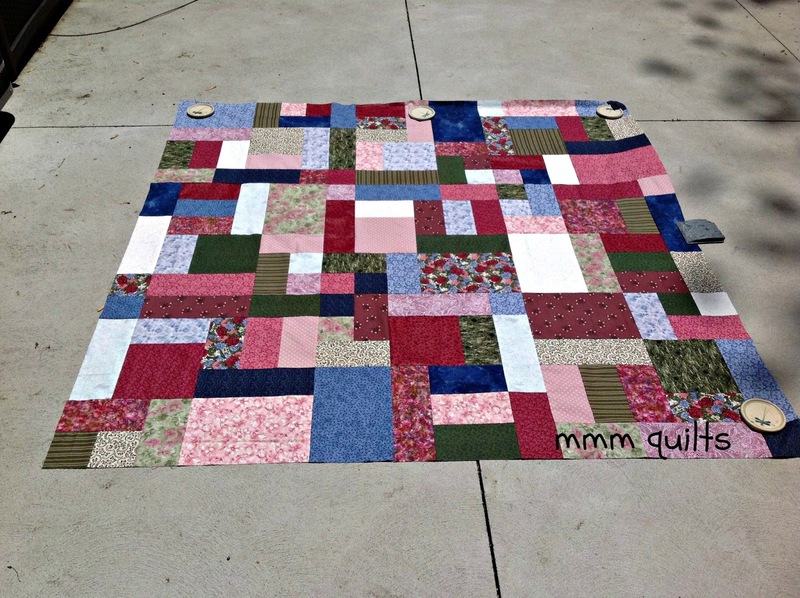 Seniors' wheelchair quilts are very lovely and your large quilt top looks beautiful! How did you ever manage to keep track of the prints? Yes, my cat sits on quilt tops too while I am working on it. They are being helpful, right? Your girl is so pretty! That is so wonderful about the senior's quilts! Yes they are perfect and I love that your guild has decided to make them your Christmas project! I've never tried flannel for batting before. Fleece works great though. I bet flannel would be nice and light. And Hooray for a sister so wonderful as LInda!!! It looks great Sandra. I'm still working on mine . It's got some similar colours. Your Grande Scrappy Tiles quilt top is beautiful!! It has such a great mix of fabrics, light and darks, florals and blenders. I can't wait to see it finished. Fabric is such a cat aphrodisiac, isn't it? Mine loves to get on her back on any quilt bits I'm laying out and then shimmy around until they're all scrunched up into a comfy little pile. Gotta thoroughly test everything for kitty quality control! That finished top is gorgeous. I love the dusty rose colors in particular. Great pics on your fabrics. It's a very versatile pattern to use up that great stash. Thanks for sharing your fabric picks for this scrappy quilt. This is sooo pretty. I would definitely make it into a summer quilt, nothing too hot on the bed, right!